Well done to eight year-old Joshua Voyse for not only braving the winter weather but landing this big carp from Float Fish Farm Fishery at the weekend. There was a better turnout than of late for the Decoy Over 55s Friday match fished on the Six Island Pool. 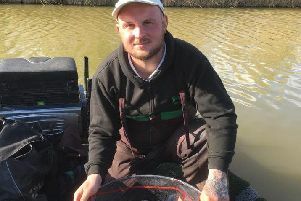 Paul Green claimed first place from peg 11 fishing the long pole line for most of the day and alternating between soft pellet and red maggot for 47lb 10oz. These are still popular matches run each Friday at Decoy Lakes and all anglers over 55 are more than welcome to fish. Just turn up on the morning of the match around 8.30am.